The value of old Singer sewing machines varies significantly, depending largely on the circumstances of the particular machine. With a history dating back to 1851, Singer has manufactured millions of machines in thousands of assorted designs and styles. Determining the current worth of any one machine can be a daunting task. In general, the value of old Singer sewing machines can range anywhere from a few dollars to several hundred or perhaps thousands of dollars. 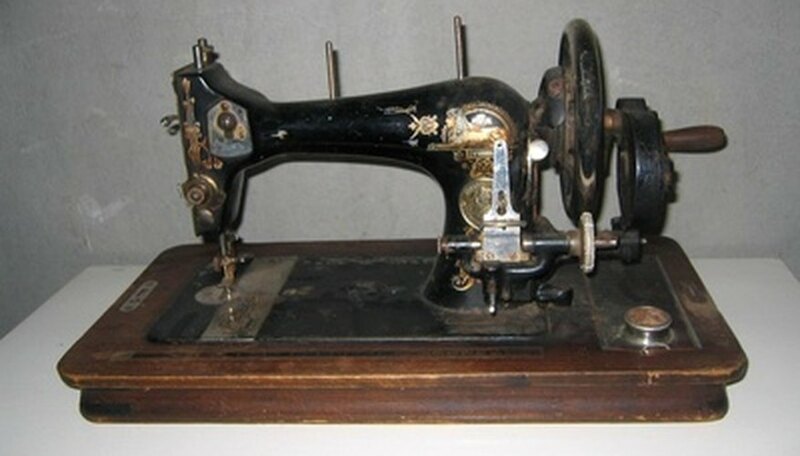 In 1850, after viewing a Lerow and Blodgett sewing machine, Isaac Merritt Singer set about making some innovative changes in sewing machine design. Thus began the Singer Sewing Machine Company, which eventually became one of the most renowned sewing machine companies in the world. Within a few years of setting up shop, Mr. Singer’s machines were being sold across the nation for $100 each. Several of the most popular machine models are more likely to be sought by collectors. Any of the Featherweight models, such as model number 221, or the Turtleback models are more likely to catch a collector’s eye. Also popular with collectors are the midget and toy models, the Blackside—manufactured in 1941 and 1947—and the Singer 301. To determine the value of an old Singer sewing machine, you must first determine the model number. Machines manufactured in 1990 and on, have the model number clearly marked on the hand-wheel side of the machine. On models dating from 1960 to 1989, the model numbers can be found on the front panels of the machines. Machines manufactured prior to 1960 should have a model number located on a small metal plate on the front of the machine. Although some of the earliest models may not have a number, the model can usually be determined by its serial number. The Singer company provides help in finding serial numbers on old machines; the website is linked in the Resources section. When determining the value of an old Singer sewing machine, you must take into account the condition of the machine. As with any antique or collectible, the better condition the item is in, the higher the value. The value of the machine will be lower it is worn or rusted, if parts and accessories are missing, or if it is not in working condition. Other factors, such as a machine’s decorative appeal, can affect its overall value as well; if the origin of the machine can be proven this can make it more desirable to some collectors. Value guides can be found in the library or bookstore, and you can check Ebay and other reputable auction sites online to see how much buyers are paying for similar models. Collectors’ discussion forums are also a great resource for finding information about your particular model and an estimate of its current value.